Modeling for Dr. Sketchy’s Anti-Art School! 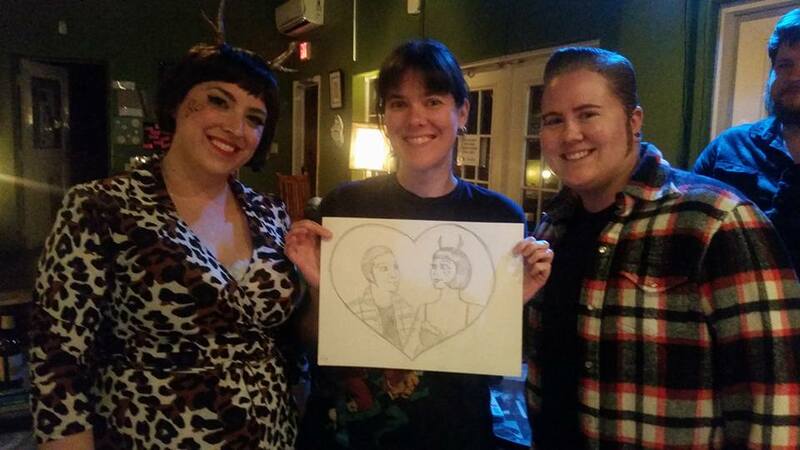 A very new experience for Queertini Time: we were invited to model for the Austin chapter of Dr. Sketchy’s Anti-Art School! 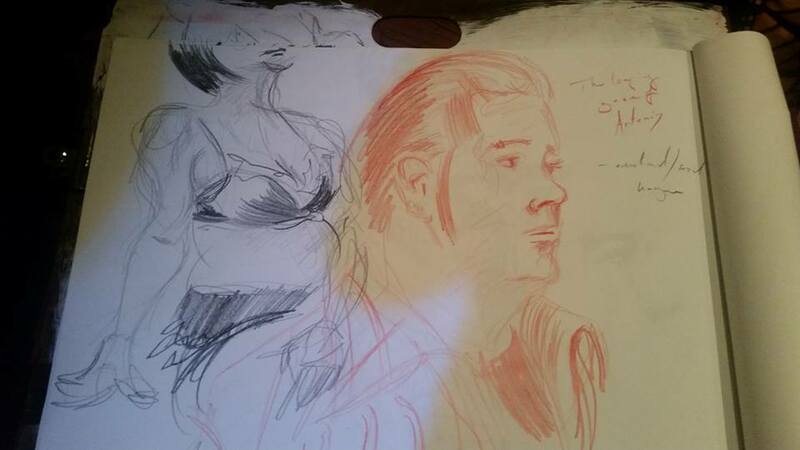 We had attended the event earlier in the year when the cast of Naked Girls Reading was modeling and we really enjoyed drawing. We were also pretty impressed by our sketching skills since neither of us draws regularly. Dr. Sketchy’s is such a fun and unique event and we were thrilled (and a little nervous) to model ourselves! We spent the days before the event brainstorming interesting poses and practicing holding some of them for up to 20 minutes! Figure modeling is really tough work! The day of the event we met up with the producers of the Austin chapter, Zaftigg von BonBon and Ginger Snaps, at the lovely Butterfly Bar and soon the artists began to arrive with materials in hand. We started the session with shorter, individual poses. It was really fun to get to watch the other person model the individual poses, but we both really enjoyed the longer poses we did together. It is a little hard to explain, but it was actually a very special bonding experience for us. Standing motionless while half-clothed in a public space as people examine your body can be pretty intense! Sharing that intense experience with your partner, while making physical contact (a hand on a shoulder, a head on a lap) produces a powerful and unique connection. 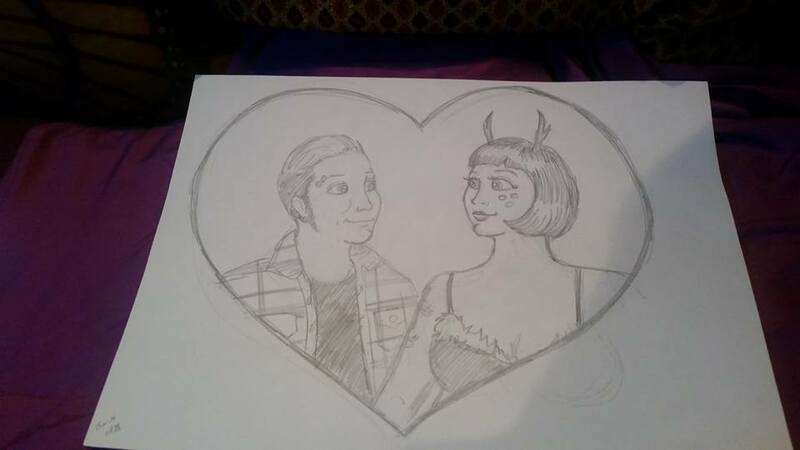 As a couple who has been together for 13 years, it is always amazing when we get to share a truly new experience and modeling together for Dr. Sketchy’s was definitely that! Then getting to see the artists’ work afterwards was amazing! It was so cool to see all their different styles and interpretations. We were blown away by all the talent and were lucky enough to be gifted some beautiful sketches of us together. Thanks again to the producers for inviting us and giving us one of our new favorite memories.